The Town of Bennett is located in Douglas County, Wisconsin and in size is 48.3 mi² (47.5 mi² Land / 512 acres Water). The elevation is 1,234′ and lies on the east/west continental divide with some water-flow moving either to the Gulf of Mexico or the Lake Superior Basin. 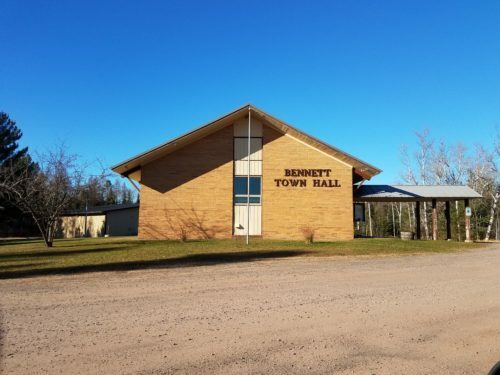 Bennett is Bennett is located 27 miles southeast of the city of Superior; and 7 miles north–northwest of Solon Springs. We have a population of on average around 600 citizens. Here in Northwest Wisconsin, we enjoy all four seasons and the proximity to the largest of the Great Lakes, Lake Superior with its port activity and shipping traffic. A great deal of commerce passes through Bennett via U. S. 53 as well as the trackage of the Canadian National Railroad. Hunting, fishing, snowmobiling and 4-wheeling are popular in this community with a major recreational trail corridor running through the community in the Wild Rivers Trail. We are as well, blessed with the many community service-minded men and women who comprise the Bennett Volunteer Fire Department and provide fire protection and first-responder service for this community and mutual aid to the surrounding communities. Two of the major fire Department fundraisers, the Spaghetti Feed and the Flea Market have turned out to be amazing social events as well with folks coming from far and wide to attend. Within the community, we have many skilled and professional people who lend their expertise in various way in service to the community. All in all, Bennett is a very nice community in which to live and get to know your neighbors. Business, family, or, a little of each. Minnesuing Acres is the ultimate getaway, exclusive destination, and, one of a kind retreat. Minnesuing Lake is located in Douglas County, Wisconsin. This lake is 432 acres in size. It is approximately 43 feet deep at its deepest point. The Wild Rivers State Trail stretches 104 miles through Douglas, Washburn and Barron counties in northwest Wisconsin. The Wild Rivers State Trail is maintained and managed by each of the three counties it passes through.